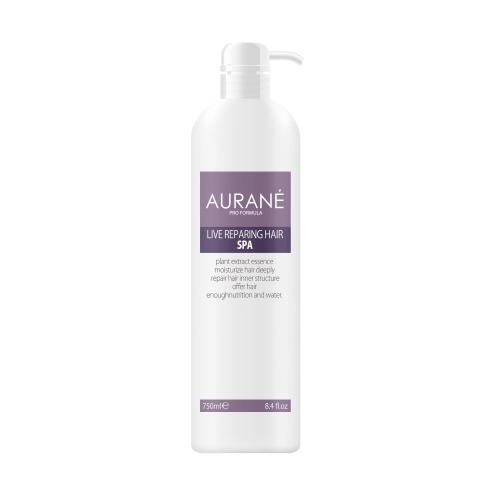 AURANE LIVE REPAIRING HAIR SPA 750ML – HAIRDEPOT - Hair & Scalp Care Products, Prevent Hair Loss, Shampoo, Conditioner, Treatment, Styling, Appliances and more! Contains nature plant extract essence, can moisturize hair deeply; the special water-soluble nutrition protein will repair hair inner structure at the most degree, to offer hair enough nutrition and water. Take about 30ml of this hair spa product into container with warm water, let hair soak into water, massage hair and scalp with finger pulp, to make hair absorb nutrition fully and rinse off with warm water.